ISIS claims it was behind the attack on a Prophet Muhammad cartoon contest in the Dallas suburb of Garland. 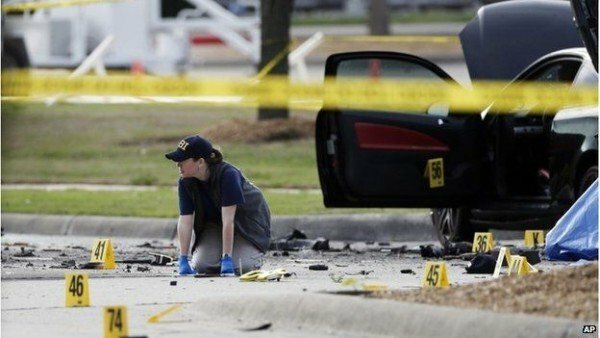 The Islamic State militant group said that “two soldiers of the caliphate” carried out the attack at Garland conference center. ISIS’ al-Bayan Radio news bulletin said the exhibition “was portraying negative pictures of the Prophet Muhammad”. Both suspects were shot dead after opening fire at the contest on May 3rd. Correspondents say that it is believed to be the first time that ISIS has claimed to have carried out an attack in the US. “We tell America that what is coming will be even bigger and more bitter, and that you will see the soldiers of the Islamic State do terrible things,” the statement released by the group said. Court documents have shown that one of two gunmen, Elton Simpson, who was shot dead during attack, had been a terror suspect. Elton Simpson had been under surveillance since 2006 and was convicted in 2010 for lying to FBI agents about plans to go to Somalia to engage in violent jihad, or holy war, the files reveal. A judge found Elton Simpson guilty of making a false statement and he was sentenced to three years’ probation and a $600 fine. The judge ruled that there was insufficient evidence that the false statement involved international terrorism. Elton Simpson had shared a flat in Arizona with the person named by officials as the other alleged gunman, Nadir Soofi. On May 4th, FBI agents searched Elton Simpson and Nadir Soofi’s home in Phoenix and a white van parked outside.